We present to you The Dairy Show! Did you know that there is an online petition to ask The Simpsons creator to make 20+ year vegetarian Lisa Simpson to go vegan? Lisa Simpson has arguably been one of society’s most well-known and influential long-time vegetarians, and we discuss how such a change could impact society, and the animals, for the better. Our feature interview is with author Élise Desaulniers. A popular and respected blogger in Québec, Élise is a food ethics and animal rights advocate who is also interested in public policy, philosophy, and feminism. 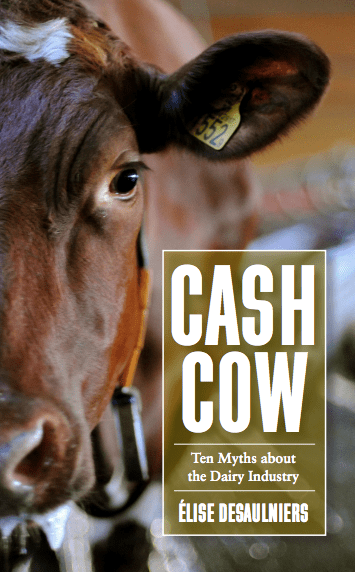 She has written a book called “Cash Cow: Ten Myths About the Dairy Industry”, which has just been translated into English, and in it, she takes a hard look at the dairy industry, and how it has persuaded the general public to believe that cows’ milk is a natural and valued part of the human diet. She asks just who really benefits from the promotion of dairy, and just how effectively animal welfare and small farming operations can be protected in an age of consolidation and confinement. In this interview, we ask Élise to speak about some of the myths of the dairy industry, and their realities. She speaks about how it came to be that humans started to consume milk from another species, when we have no nutritional requirement for this. She also talks about the dairy industry’s messaging in the media, particularly in Canada, and how that messaging has impacted North American citizens, from since we were children, into latching onto the ideology that we need cow’s milk to survive and thrive. Élise discusses other topics such as the hormones and allergens that come with a glass of dairy milk, the connections between feminism and dairy, and how we, as a society, can wean ourselves off false beliefs (and the challenges in doing so). Earth Day is coming up on April 22nd, and Élise tells us about the environmental footprint associated with dairy, which may be surprising to those who don’t eat meat for environmental reasons, but who still consume milk! Élise will be speaking at the Dairy-Free Living course coming up on April 3rd in Vancouver this weekend. For our first interview, we have Brigitte Gemme on the show. She is the organizer of a première (sold-out) course happening in Vancouver this weekend called Dairy-Free Living, which will teach attendees how to thrive without dairy. The Dairy-Free Living half-day course is hosted by a Brigitte’s social venture called The Low Impact Lab, as well as the local non-profit Earthsave Canada. In this interview, Brigitte tells us all about this initiative and how she plans to hold similar events in the future to meet a demand for education in why we don’t need dairy, and how to shift to many delicious and nutritious plant-based foods instead. In addition to featuring expert speakers Élise Desaulniers and well-known vegan dietician Vesanto Melina, the course will also present a taste-testing component, which will show attendees how to put their new-found knowledge into practical action. There will be over 30 samples of dairy-free and vegan ice creams, milks and cheeses for everyone attending to try out! It’s an exciting initiative for the community, and Animal Voices looks forward to keeping in touch with Brigitte about her future Dairy-Free Living endeavours. To make sure you can find out about future Dairy-Free Living events, sign up for the e-newsletter here.